1966 CHEVROLET ACCESSORIES INSTALLATION MANUAL - SS, Impala, Biscayne, Bel Air, Caprice, Full-size wagons, Chevelle, Malibu, El Camino, Chevy II, Nova , Corvair, Chevy Van, Sportvan, Suburban and Pickup Truck. 1966 CHEVROLET ACCESSORIES INSTALLATION MANUAL - SS, Impala, Biscayne, Bel Air, Caprice, Full-size wagons, Chevelle, Malibu, El Camino, Chevy II, Nova , Corvair, Chevy Van, Sportvan, Suburban and Pickup Truck. 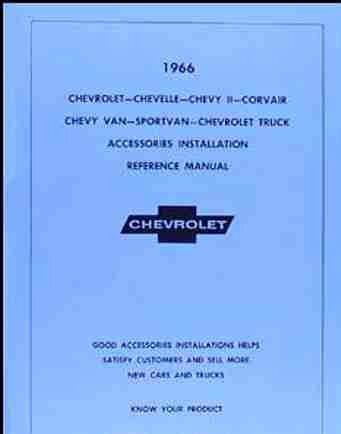 66 CHEVY"1966 Chevrolet-Chevelle-Chevy II-Corvair-Chevy Van-Sportvan-Chevrolet Truck Accessories Installation Reference Manual" This is a quality reprint of the manual issued by Chevrolet to help mechanics to install genuine Chevrolet accessories. You will find step-by-step installation instructions accompanied by exploded view illustrations making every procedure a breeze. 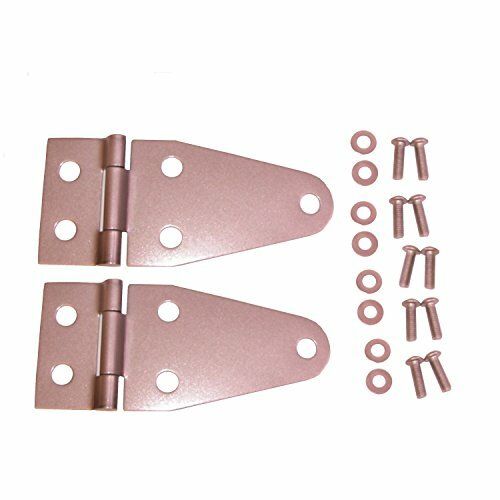 You will also find original part numbers to easily reference all available accessories including: air conditioners, antennae, power brakes, luggage carriers, clocks, cruise control, compass, rear window defrosters, bumper guards, trailer wiring & hitch, heater, lights, mirrors, mouldings, radios, ventshades and much, much more! 529 pages, brand NEW condition. This manual covers genuine accessories for all 1966 Chevy models including SS, Impala, Biscayne, Bel Air, Caprice, Full-size wagons, Chevelle, Malibu, El Camino, Chevy II, Nova , Corvair, Chevy Van, Sportvan, Suburban and Pickup Truck. Buy now to find out how to make your Chevy into a "loaded" model. 1963 Impala, Bel Air, Biscayne HOOD EMBLEM ASSEMBLY, INCLUDES HARDWARE. Just as General Motors did it!! This clear acrylic emblem is back painted with UV stabilized paint to prevent color fade. TrimParts researched to assure accurate colors. This emblem is secured in the die cast and chrome plated bezel with cast in tabs just like GM did it! 1962 Impala, Bel Air, Biscayne HOOD EMBLEM ASSEMBLY, INCLUDES HARDWARE. Just as General Motors did it!! This clear acrylic emblem is back painted with UV stabilized paint to prevent color fade. TrimParts researched to assure accurate colors. This emblem is secured in the die cast and chrome plated bezel with cast in tabs just like GM did it! 1962 Impala, Bel Air, Biscayne HOOD EMBLEM. Just as General Motors did it!! This clear acrylic emblem is back painted with UV stabilized paint to prevent color fade. TrimParts researched to assure accurate colors. 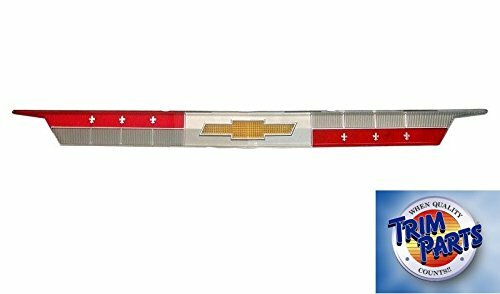 This emblem is secured in the die cast and chrome plated bezel with cast in tabs just like GM did it! Dayco was first to develop a v-belt with the raw edge sidewall construction; which maximizes pulling power and facilitates controlled slippage around pulleys. The raw edge construction is combined with Dayco's patented cogged top design to ensure the top performance that today's vehicles and drivers demand. Dayco Top Cog V-Belts meet or exceed SAE J636 and J637 specifications. This Top Cog V-Belt is another Dayco product proudly made in the USA. 1964 Impala, Bel Air, Biscayne HOOD EMBLEM. Just as General Motors did it!! This clear acrylic emblem is back painted with UV stabilized paint to prevent color fade. TrimParts researched to assure accurate colors. This emblem is secured in the die cast and chrome plated bezel with cast in tabs just like GM did it! 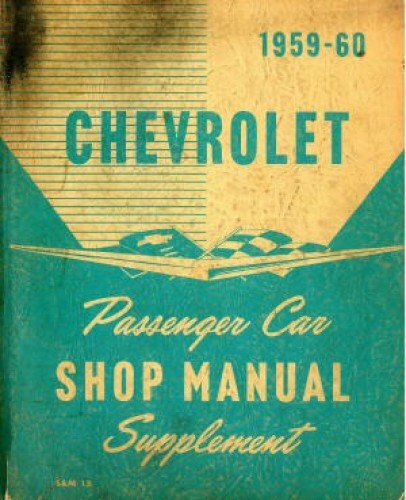 This brand new Chevrolet Shop Manual Supplement covers all 1959 & 1960 Chevrolet Car models including the Biscayne, Bel Air, Impala, El Camino, Brookwood, Parkwood, Kingswood and Nomad. Measuring 8 ½ x 11, this manual is over ½" thick and is loaded with specifications, wiring diagrams, illustrations, photographs and guided instructions covering: the electrical system, frame, suspension, driveline, brakes, engine, clutch, manual & automatic transmissions, fuel & exhaust, steering, body & sheet metal, wheels & tires, radiator & grille, and heating & air conditioning. Looking for more Impala Bel Air Biscayne Hood similar ideas? Try to explore these searches: Blossom Time Cup, Diamond Jig, and Safe Heated Motorcycle. Shopwion.com is the smartest way for comparison shopping: compare prices from most trusted leading online stores for best Impala Bel Air Biscayne Hood, Vega Tire, Padded Leather Bass, Biscayne Hood Air Bel Impala . Don't miss this Impala Bel Air Biscayne Hood today, April 24, 2019 deals, updated daily.